Step into Russia during the Soviet Union era. Russian Stories, Soviet Ideals is a fascinating exploration of the duality of the ideals of the centralized Soviet government and the realities of everyday life for the Russian (and non-Russian) people – politically, at work, at home, and on the land. Featuring Soviet artwork with highlights from the Jerald Jacobs collection. 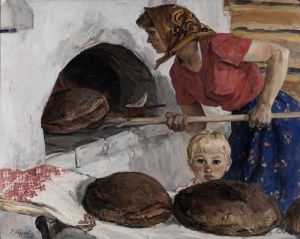 This dynamic exhibition depicts sweeping as well as personal stories that raises such questions as what were the ideals of the Soviet government for the factory, the home, and the farm? How did this affect the life of the women, men, and children in these spaces? How did they assert their own ideas, culture, and family ideals into the one-party, centrally controlled Soviet Union?